In the words of wise reality TV contestants throughout history: I’m not here to make friends. As business people (whether we’re sat in a cubicle, or working for ourselves) we can be all tough talk and important strategies…but then the human element just gets in the way. You let project scope get out of control because you don’t want the client to think you’re a taskmaster. You give away a ton of freebies because you want people to think that you’re generous. You give away concessions during a negotiation (money, time, energy, first-borns) in hopes that the Other Guy will think that you’re gosh darn swell as a human being. And they may. Or they may not. But either way – you’ve just handily secured yourself the short end of the stick. 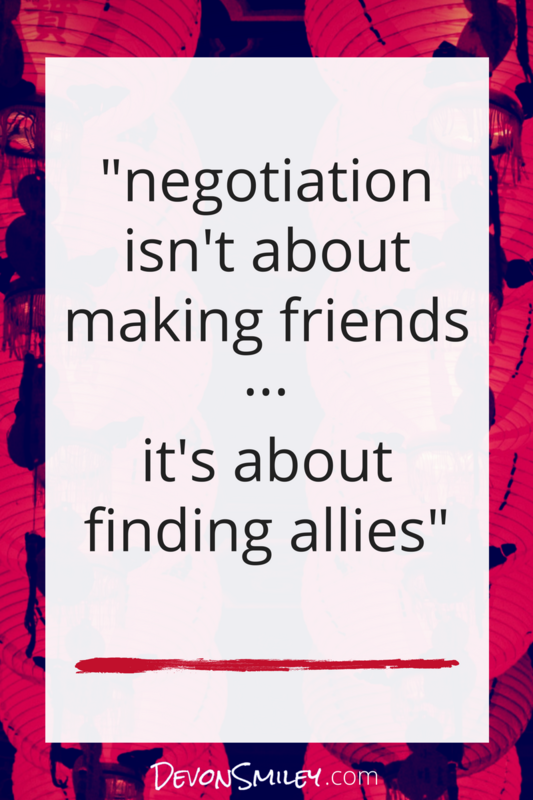 Relationships are important in negotiation. And being likeable is a great way to get what you want or need. But when being likeable becomes your top focus? That’s when we get into trouble. It’s not to say that you need to run around being an emotionless business deal making robot in order to get best results. Relationships are important, but it comes down to being respected, rather than being liked. I’ve had to drive some hard deals in my day. Ones where – quite frankly – it was going to be impossible for someone to like me very much when all was said and done. But I did my job with professionalism and politesse, taking the high road and avoiding anything remotely sneaky/shady/deceitful. And we got a deal. And at the end of the negotiation I probably wasn’t their favorite person…but they respected me and the work I’d done. What does being “firm but fair” look like for you? Giving tough but honest feedback on a client’s idea? Drawing a line in the sand on iterations? Setting a bottom-line price before discussion your proposal…and sticking to it? If you’ve been bumping up against the issue of wanting to be liked when you’re doing business, then your homework for this week is to speak up and ask for what you need. Sounds simple - but I know that may feel really tough right now. If you’re looking for a confidence boost, send me an email at devon@devonsmiley.com and let me know what you’re struggling with - I’m here to help.